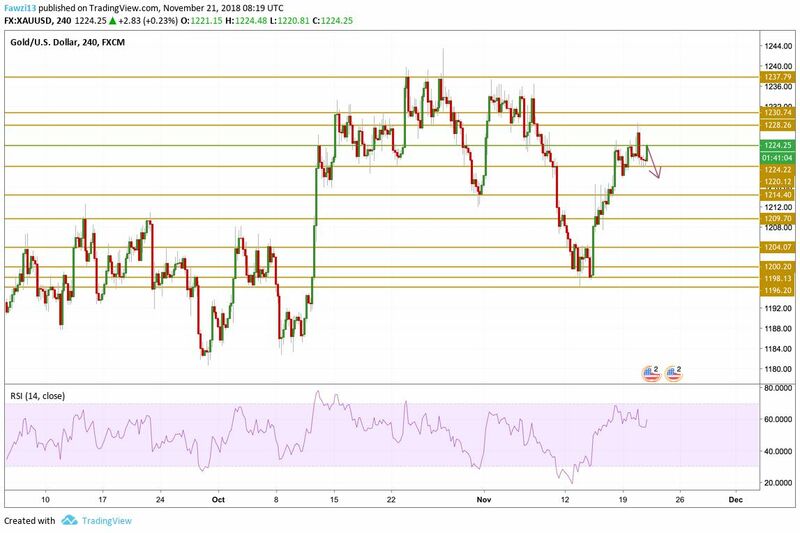 Gold prices moved with a bullish bias until the beginning of the NA session, peaking at 1228 and then turned to the downside pulling back and during the last hours accelerated the decline. The retreat in prices took place amid a rally of the US dollar across the board and also on the back of a risk-off mood. Equity prices in Wall Street are falling sharply but safe haven assets were not the alternative. Today’s core durable goods will be a crucial event for the greenback as it is expected to increase by 0.4% from last month, increasing pressure on the yellow metal. The bulls were in control earlier in the session on Tuesday pushing Gold prices all the way to $1228 per ounce. The rally was not sustained as a trend reversal later in the day caused gold to tumble back and print fresh daily lows at $1219.8. The price is currently hovering just below the 1224 level rebounding from the key technical support at $1220. However, momentum is relatively declining providing no traction for the yellow metal to build a run to the upside. The next level we will be focusing on is the $1218 level.